That Fiberwig mascara packaging vaguely resembles the distinctive Tokidoki design hehe. I love looking at your eyes! They are so beautiful, kinda big like anime eyes hehe. OMGG this was so great!!! i wanna get that now. ahhhh. the blog kills me. LOL. (my wallet that is) lol. i really like your eyes! that mascara looks nice.. I LOVED the review! :D You make me want to go and buy both Fiberwig & an electronic eyelash curler!! XD I'm trying to save money right now, but you make me so tempted to go and order one of both. You mentioned that you use the electric eyelash curler all the time and I was interested in getting it coz your lashes always look so amazing... the only thing stopping me was that I had no idea on how to use it! so this was really helpful! <3 thanks! the flower clip is so cute eki :) did you make it yourself? Awww Eki!! I can't watch the vid here. But I'm gonna catch it on your YouTube channel!!! oohh you reminded me! I have a heater curler somewhere in my kit :) I bought it years agooo and it still works! I should pull it out and do a review too :) is the mascara waterproof? i love fiberwig! not sure i would repurchase tho bc of the price =) i wonder if i really want to get a heated curler tho.. so tempted! I wanna get the heating curler too! Thank you for the link to purchase it! I will get my hands on it. ^^ and thank you for the video. It's so helpful! I love what mascara can do for the lashes but dislike the ‘removing’ part! Heheee..
and such co-incidence I bought the Fiberwig limited edition too. First time trying that mascara cuz I heard good reviews. and saw the packaging is so cute. So I bought it. and ur eyes are so big and pretty .. i want mine like urs..
What contacts are you wearing in your pics, they are gorgeous!! woah! what a major difference it makes. I definitely gotta try the electronic lash curler. thank you for sharing and the review. Aw I wish I had as long lashes as you! I have a monolid too so I can never get that effect! thank you for becoming a follower. you're so pretty! i love your contacts. they're so blue! and the electronic lash curler does make a difference. can you burn yourself from using it? thanks for the review! I love how your eyes just POP...very pretty! Looks like it worked its magic! How lovely! i bought the heated eye lash curler as soon as i saw your post. i checked back its now temp out of stock! can't wait to give the curler a try when i get it. thanks! i was wondering if the electric curler made your eyelashes dry and brittle. do you have to condition them?? i have the same national lash curler too.. i bought mine in 2002 and its slowly not working anymore :( i dont like the look of the new one either.. national should bring back the old slim ones!! i looove fiberwig! but for some reason when i used my no name lash curler, it kinda made the mascara melt or something. well i use the fiberwig on top of another mascara just to keep it from smudging...weird that that'll happen. great tut! i'm definitely up for anything that makes my lashes more noticable (stupid asian straight lash curse!) haha I don't think even with fiberwig and a heated curler, I could make my eyes as pretty as yours! those lens look awesome! i'll have to try some for myself. you have the cutest nose ever too! lol i'm not joking. 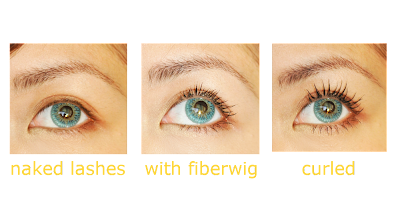 i have yet to try the fiberwig mascara... your lashes looks great. Thanks for sharing! you are making me lemming that eyelash curler big time! Hey babe, Thanks for this review. I happened to have the Fiberwig mascara too but I guess I didn't really know how to use it, so it has been in storage ever since. lol.. I just tried the 2 items together & they work well together! I would like my lashes to be a bit more curled but at least it doesn't point straight down anymore! & of course removal with warm water is a breeze! Thx for this tutorial, I've always been curious about electric lash curlers and now I really want to go get one! Would it work just as well if you curled them first then applied mascara? i cant live without fiber mascara!! hehe i like the word BOOST! What brand are your coloured contacts? They're beautiful! Really easy to use and got many compliments on it.. Love!!! !